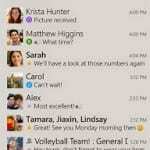 BlackBerry Messenger, BBM is now available for Android phones and iPhones. Owners of Android phones and iPhones can now have a feel of what BlackBerry users have enjoyed for years. You can Download BBM for Android phones and iPhone free at their respective apps stores. BBM supports all Android phones running Android 4.0 (Ice Cream Sandwich) and above and all iPhones running iOS 6 and above. You can download BBM for Android at the Google Play Store and BBM for iPhone at the Apple Apps Store.